Happy Monday, readers! This is a post that I’ve been contemplating for a while, as sewing can definitely be an expensive hobby and it seems that fabric and notions are increasingly getting more expensive. So, whether you’re a (relatively) poor college student (like me!) or just on a budget, here are some tips I’ve found help to make sewing a less costly endeavor. Buy the highest-quality fabrics and notions you can afford. Well-made, natural fiber fabrics are worth the investment (and sometimes they needn’t be expensive, especially if you thrift) and will last longer than cheaply-made synthetic fibers. Thrift whenever you can – It’s amazing what people give away to a thrift store sometimes, huh? But I’ve found amazing fabrics (like some great wool pieces, polished cotton, and fabulous printed cottons) and vintage patterns for under $1. Considering what some etsy sellers are charging for vintage patterns, buying from the thrift store can definitely save you a pretty penny, as well as shipping costs (you might have to pay sales tax in your area, but even a 9% sales tax on a $1 pattern is cheaper than any shipping costs). One caveat, however: thrift stores are very hit and miss. Somedays you’ll find amazing stuff, and other days you’ll come away with nothing. Don’t be discouraged, though, and realize that thrifting does require an investment of time. I recommend finding out when your local thrift store puts out there new merchandise, and then plan to visit your thrift store on that day. Also, many thrift stores will have weekly sales, so take advantage of those. If you’re going to make a mock-up or test garment, use old sheets rather than muslin. If I had a nickel for every time I’ve seen the command “make a mock-up first!” in a sewing book, I’d be rich (okay, I wouldn’t be rich, but I’d definitely have enough to buy a candy bar). And while I think that it’s great advice, I don’t always make a muslin. Sometimes after I’ve made the garment I wish that I had, and, well, that’s sewing karma for you. That being said, mock-ups are great ways to try out your patterns, but rather than paying $2 a yard for several yards muslin to do so, you can go to the thrift store and get a sheet for that amount and use that to mock-up. Added bonus? You’re also being environmentally friendly by reusing something, rather than buying new. Shop your stash first before buying anything new. You would think that if you’re sewing on a budget, you wouldn’t have a massive stash of fabric piled up in your closet. Wrong (at least in my case). There will be cases, of course, when nothing in your stash will work for the project you’re contemplating and you’ll need to purchase something else. Trade fabric and patterns with your sewing friends. Exchanges like these are great ways to get new-to-you items in your stash for no money at all. Sign up for coupons from the big fabric chains. Places like Joann’s and Hancock Fabrics have a program where you can sign up to get their mailers and they’ll send you coupons about every 2 weeks. Joanns also puts coupons in the Sunday paper, which you can use in conjunction with your mailer coupons for added savings! Anyways, I hope these tips have been helpful! If you have any money-saving tips when it comes to sewing, please do feel free to leave them in the comments! 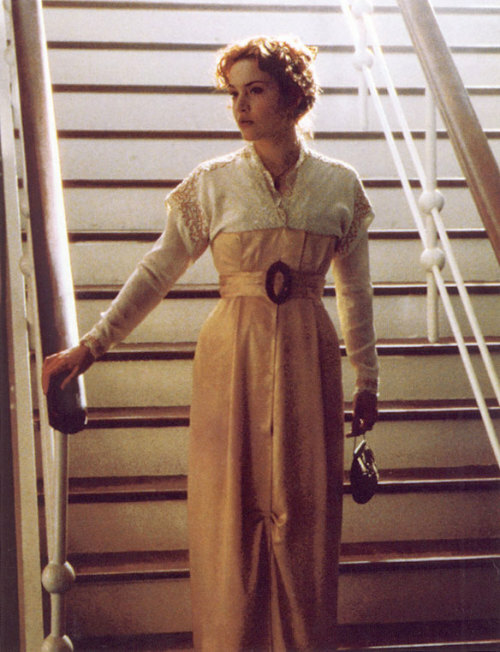 Readers, I have no idea what direction to go in when it comes to my dress for the Titanic tea. Granted, it’s still a month and a half away, and I’m still working on underpinnings, but being me, I like to know what I’m going to work on. So, it’s with this thought in mind that I’ve decided to do some “thinking out loud” (via the internet) in the hopes that getting all of the confuddling dress thoughts out of my head and articulated into words will help me make a decision. So, my first thought was to reproduce a dress from the film (the 1997) version. This is my favorite movie of all time, not just becuase of Leo Dicaprio, but also because of the costumes, (unplausible but lovely) storyline, set, and music. Anyways, I’ve always loved this yellow dress Rose wears, but then I thought that I didn’t want to do all of that embroidery around the bodice (what can I say, I’m a gal that likes a quick sewing project). Then I *briefly* considered recreating the navy blue satin and velvet dress, but this one has been so overdone that that discouraged me. What can I say, I’m an individual (which is why I’m considering reproducing the lesser-known costumes from a blockbuster movie). So, with the Titanic movie costume choices all fraught with some issues, I decided to turn instead to another one of my favorite Edwardian costume dramas, Downton Abbey! 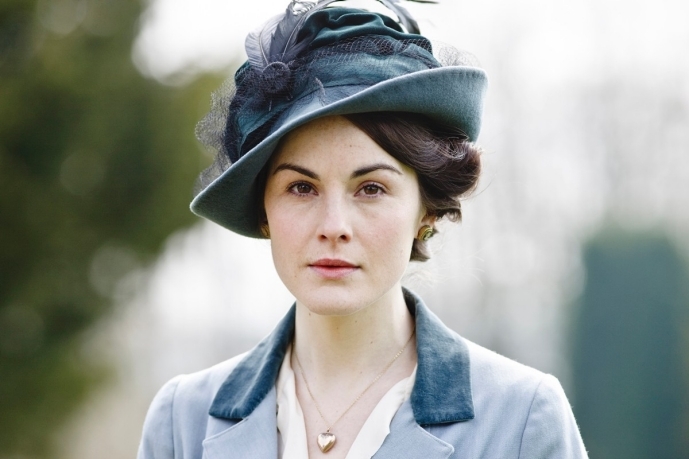 I love this lavendar stiped dress that Lady Mary wears in the first season, and it looks simple enough. 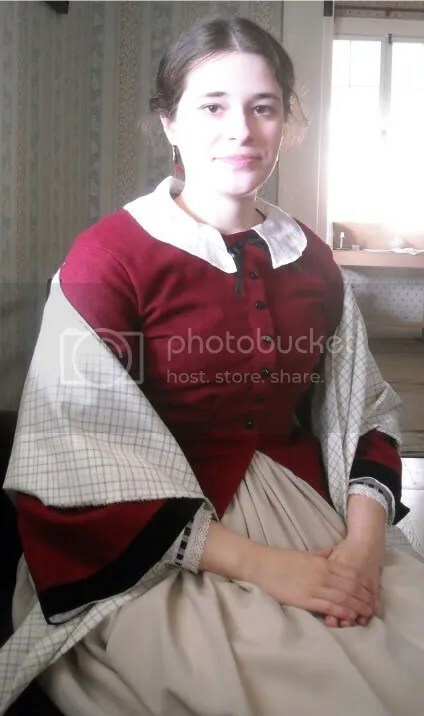 I’m just worried about it looking too “old lady” or “school marm,” especially with the lace that is tacked to the front. I also like her jaunty little “walking into town” outfit (complete with a fabulously-trimmed hat!). I’m just worried about this being too many pieces (3 altogether) to get done in the amount of time I have. Velvet, striped silk, and lace - oh my! 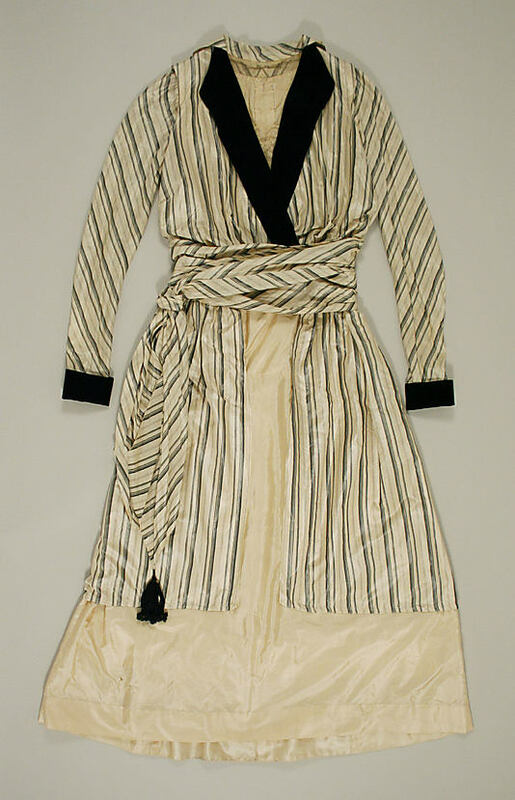 Finally, I looked at some original dresses from The Met, and I fell in love with this striped ensemble (it dates from 1913-1917, but I think that’s close enough). I’m just having problems finding a striped fabric that’s comparable with this one, so I may just have to go with what I can find that’s close enough. 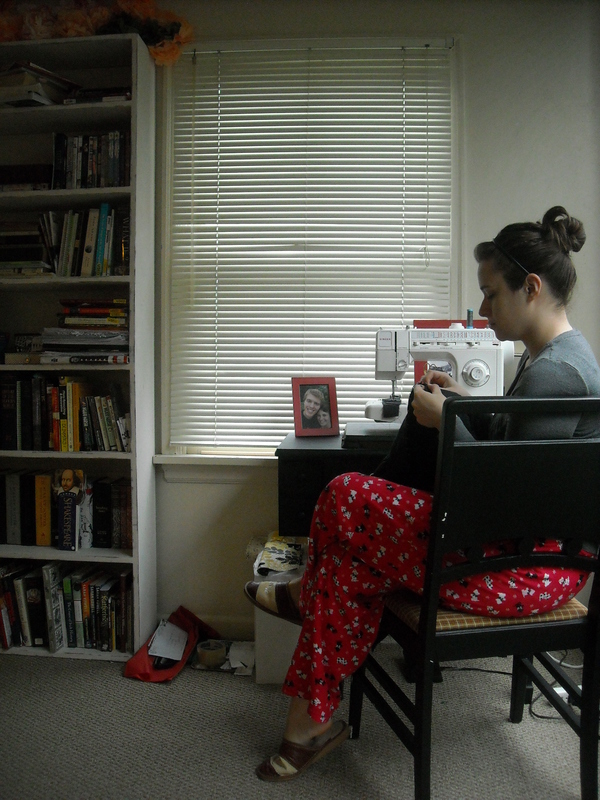 Yeah, I did just post a picture of me in my scottie dog pajamas and messy bedhead bun on the internet . . . In terms of my creative process, Saturday mornings are often a rejuvinating period for me. The school week is over, I normally had a relaxing Friday night, and Saturday mornings are spent sleeping in and then waking up to do some sewing. It helps that here in the Pacific NW, Saturday mornings from 8 to 12:30 PBS runs sewing shows, most of which are incredibly inspiring in terms of both getting me to sew, and provind me with new project ideas (not that I need any more projects, mind you, but still). Normally I start watching around 9, when It’s Sew Easy comes on (prior to that, it’s just old lady quilting shows), followed by Sew it All. Usually, I’ll watch Sewing with Nancy afterwards and sometimes Martha’s Sewing Room (since she shows a lot of vintage garments), but the majority of the shows after that are old lady quilt shows, which I don’t really watch, with one exception: for lols, I’ll finish my Saturday morning sewing show marathon with Quilt in a Day. I rarely, if ever, quilt, but Eleanor Burns is such a crazy cool old quilt lady. Seriously, even if you don’t sew, I would recommend watching an episode of Quilt in a Day sometime. It’s hilariously entertaining (as well as informative! ), and I hope I’m that vibrant when I’m her age. So, that’s a typical Saturday morning for me. This morning I started watching my sewing shows while working on a new skirt (Simplicity 2512) which I cut out last year, but didn’t start sewing until last week. I plan on leaving the house to run some errands including a run to the post office, grocery shopping, and some thrifting. But, with 3 days off from school, I definitely plan on getting some major sewing done, including the skirt mentioned above and finishing the mock-up of my modern dress commission. I may also eke out a new tote bag, but we’ll see how that goes. So, with that in mind, I’m looking forward to a long weekend of stitching, but I am curious: are weekends more productive for you in terms of sewing? And, if there are sewing shows in your area, do they inspire you to create? 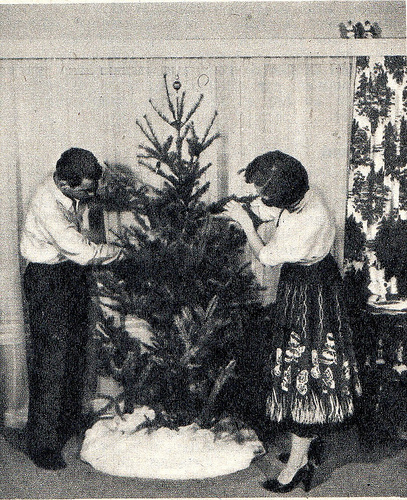 With that in mind, I’ve decided to do something I’ve always wanted to do: have a handmade Christmas! This year, I’ve decided to make most (if not all) of my gifts for family and friends. I think there’s something so personal and heartfelt in making a gift for somebody you love out of your own two hands, as opposed to just buying a gift card. 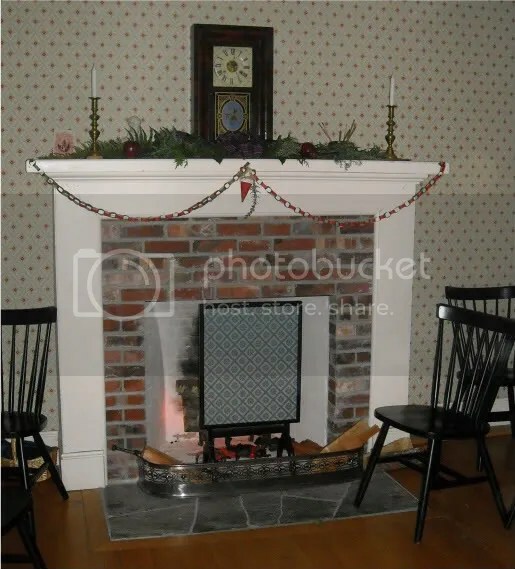 Speaking of ribbons and a handmade Christmas, this past weekend was my last reenactment of the 2011 season, 19th century Christmas! Even though I could not stay for the whole thing, I had a fabulous time, playing parlor games and catching up with the lovely reenactors I’m fortunate to know. Anyways, my holiday party is this weekend, and I’m so excited! I’m really hoping I can squeze out a new dress for it (after much back and forth, I’ve decided that I want a red shirtdress! Luckily, I have the pattern and it’s one that I’ve used many times before), in between the writing of my 15-page paper(do they realy need to be this long!?) and decorating my place for the party this weekend. I hope you all are having a lovely holiday season thus far, in whatever way you choose (or don’t choose) to celebrate. Alright, off to go take a power nap before working on my paper . . . It occured to me last night, while watching the season finale of Project Runway that maybe I just work better under pressure. My frame of reference for this, of course, is Anya. When she worked on her collection for 5 weeks at home and then came back to New York, the judges were totally underwhelmed. But after 2 days of pressure sewing and intense re-evaluation of her stuff, she ended with a fabulous collection and won the season (I would have personally prefered Victor to win, as I love his little bow-ties and his stuff is more my aesthetic, but I’m happy for Anya). 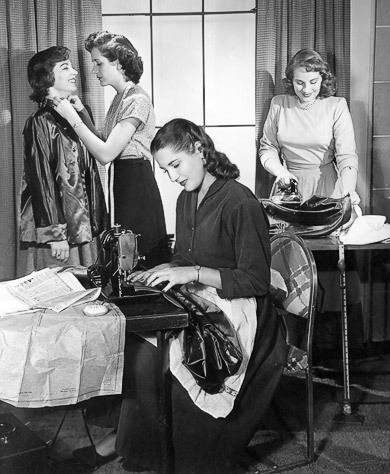 But sewing, for the most part, has been a pressure and time-sensitive hobby, mostly because I’m in school full time (and I’m sure this is similar for those of you that work). But another part, as much as I hate to admit it, is also procrastination. It’s one of the things I really do best. And there’s sort of a running joke at the museum where I reenact about my procrastination sewing, since I’m often finishing a new dress or item the night before (and sometimes the morning of). But I’ll do whatever it takes to finish, even if that means pinning myself in (either with safety pins or straight pins, although the later hurts more). So, it is with this same theme of Friday-night sewing, Saturday event that I find myself with another last-minute project: my halloween costume. I actually get compared to her all the time by my friends. And I have to say that if I were to host an underage high school drinking party, I would totally hand out 2 vouchers per person for wine coolers. The reason for this is two-fold: 1) I have some fabulous Lisette fabric that would work perfectly for this and 2) I can get a new dress out of this that I’ll wear on more than just Halloween. Actually, this is most of my motivation. So, it’s with this in mind that I’m starting my costume/new frock tonight, as a result of having both a paper and a midterm this week (in the same class!). I’m already using a pattern that I’ve used before, so I’m hoping that things will go smoothly. And the Halloween party that I’m going to is tomorrow night, so I should (hopefully) have plenty of time to whip it up.